SPORTS ASSOCIATIONS, LEAGUES AND BRANDS UNITE! THE IGIFTBAG IS READY FOR ACTION! SHOWCASE SPONSORS IN NATIONAL ASSOCIATION EDITIONS. Your national, regional or state association can showcase your brand partners in one turnkey igiftbag that can be distributed to all of your affiliate leagues, teams, clubs or tournaments from an association-branded igiftbag website. Enable your national partners to target and connect to your thousands to millions of youth sports parents and coaches with gifts, such as discounts, deals, giveaways, promotions, among others. Your local leagues can also opt to distribute with your association’s permission your turnkey igiftbag and add gifts from its local sponsors. LOCAL SPONSORSHIP SALES MADE EASY. It’s easy for your sports league to integrate the igiftbag seamlessly into your local sponsorship sales activities. You can setup a sponsorship sales web page in a minutes to promote your igiftbag to all of your sponsors and enable them to learn about the igiftbag’s features and benefits, highlight key information about the sponsorship rates you elect to charge, and provide the online tools for them to instantly create their gift offer. Create a sales page invitation page in minutes for your partners and sponsors to learn more about creating a gift. Send custom Gift Invites to them. Track their responses and progress of your partners and sponsors on your RSVP and Manage gifts dashboards. ADD GIFTS FROM NATIONAL PARTNERS. You don’t have to rely just on your local or national sponsors to create great gifts. 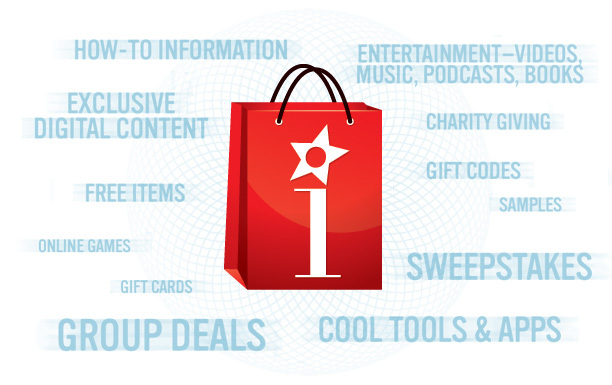 Every igiftbag can be fully loaded with “wrapped” gifts from our sports league Gifts Catalogues from leading brands and media partners (discounts, deals, PDF expert tips, book downloads, expert videos, games, Mp3s). As the pioneer of the virtual goodie bag in youth sports, we’ve developed special techniques built-in to the setup and design to raise your igiftbags appeal and engagement level with your event participants. Perfect for: National, regional and state sports associations. Leagues. Teams and clubs. Tournaments. Fundraising.